I tried the Ribbon Fries from this cart. Fresh potato chips like this are normally pretty tasty, but the potatoes near the bottom of this plate were somewhat soggy. I also got some roasted corn from this stand (Little Richard's?). How can you go wrong with an ear of corn roasted on a grill, dipped in butter, and then served by grumpy carnies? Pizzeria Valdiano is a local chain in Central Florida. I've been to their Winter Park and Baldwin Park stores on several occasions and recently gave their Lakeland store a try. We started with garlic knots. Definitely not the best. They were those mushy, interconnected rolls that had some garlic salt on top. With garlic in the name, I want some actual garlic! 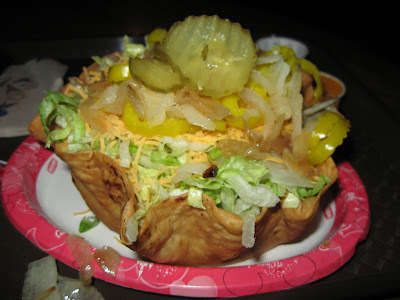 I used to think the food from Disney was pretty awesome compared to most other theme park food. 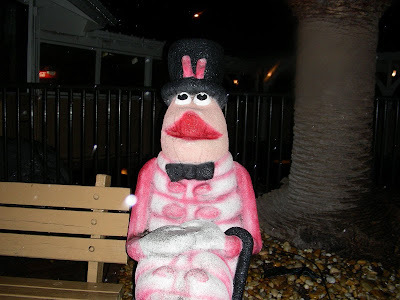 On my latest visit to the Magic Kingdom, I realized that this has changed somewhat. It had been a few years since my last visit to the park and the fast food dining options have definitely shrunk. There were some places serving more interesting food (like the Asian noodle place in Tomorrowland or the Mexican in Adventureland), but they were all closed on the day I visited. Out of the open dining options, restaurants that I remember having having interesting menus (Cosmic Rays) seem to have expanded their burger selection and eliminated many of their other foods. I'm all for salad bars. Salad bars can be good, that is if you know you're getting a salad bar. 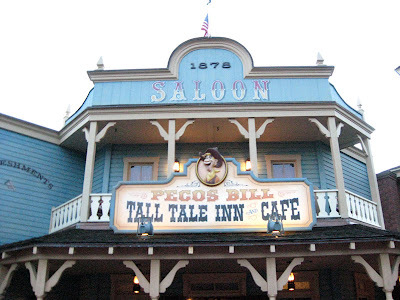 When I ordered at Taco Salad at Pecos Bill's, I did not realize I was getting a pretty lousy salad bar. After ordering, they handed a fried tortilla bowl filled with some ground beef and a sour cream packet. 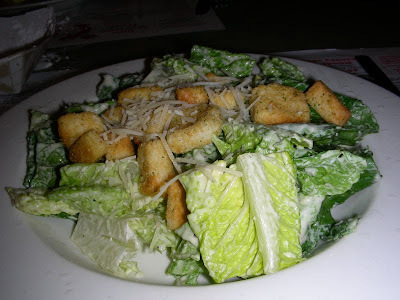 The lack of vegetables in the salad left me somewhat confused, but then was directed to the restaurant's topping bar. With some lettuce, cheese, banana peppers, sauteed onions, and pickles, I filled my tostada bowl. While I did make my salad tasty, it was definitely not what I was expecting. For $8.50, I was thought I'd be getting more than a tiny bit of meat in a tortilla. I really was expecting a ready made salad, with the main salad components already in place. I would not consider a hamburger topping bar to be a good salad bar either. Bogard's is located on International Drive in Orlando. I came across Bogard's a while back when I was looking for the Amigo's that formerly sat at this location. Several months later, I decided to give Bogard's a try. Actually, the main reason I wanted to eat here had to do with the very cool water spouts draining off the building's roof into an alligator filled pond below. I didn't know much else about the place, but decided to give it a try. Inside, the restaurant had a biker theme that wasn't obvious from the outside. Really tasty jalapeno corn muffins were served as an appetizer. I decided to order The Bonafide Shrimp Po'Boy. I was considering a few other menu items, but they were all pretty expensive for what you were getting. Some of the barbecue sounded good, but all the sides were sold separately. From the menu description, it sounded like all you got was meat and bread for twice the price of a complete meal elsewhere. Shrimp & Grits also sounded good, but $17 sounded a bit much for something I've had success cooking at home. So, I went with a $13 sandwich, served with fries. The Po'Boy didn't have much flavor. 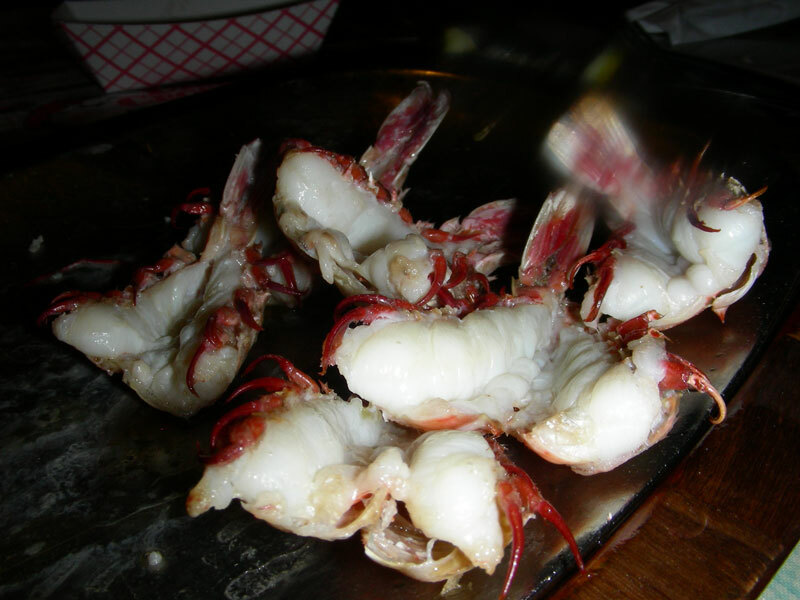 The fried shrimp were very bland. The cole-slaw that topped the sandwich was way too soggy and messy and also didn't have much flavor. The sandwich was edible, but definitely not worth $13. 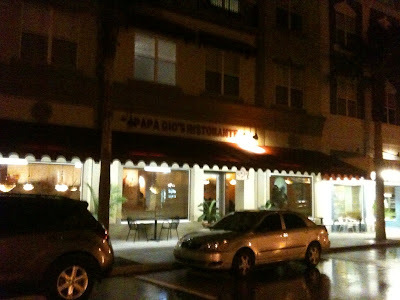 I had a breakfast at Appleton's Hometown Cafe in Lake Mary. 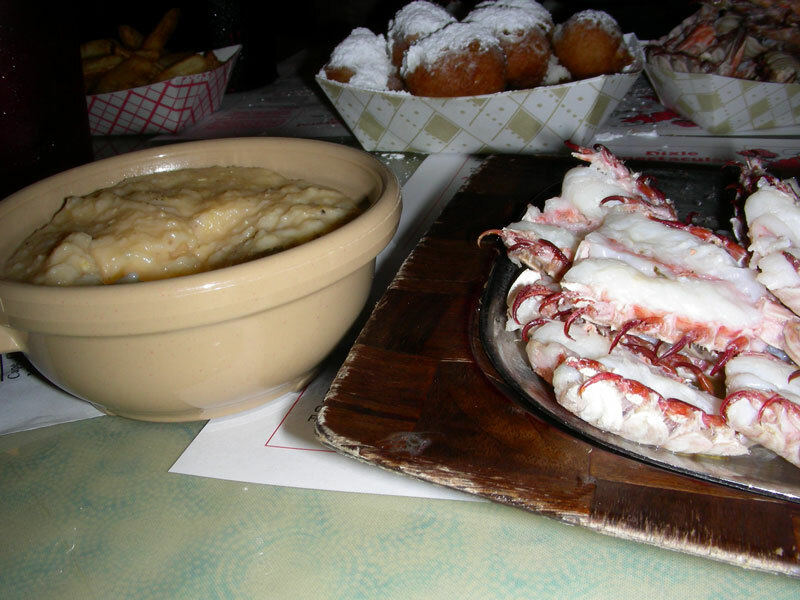 When I was invited along with someone who had a coupon for a good deal on all you can eat rock shrimp at Dixie Crossroads, I gladly agreed. 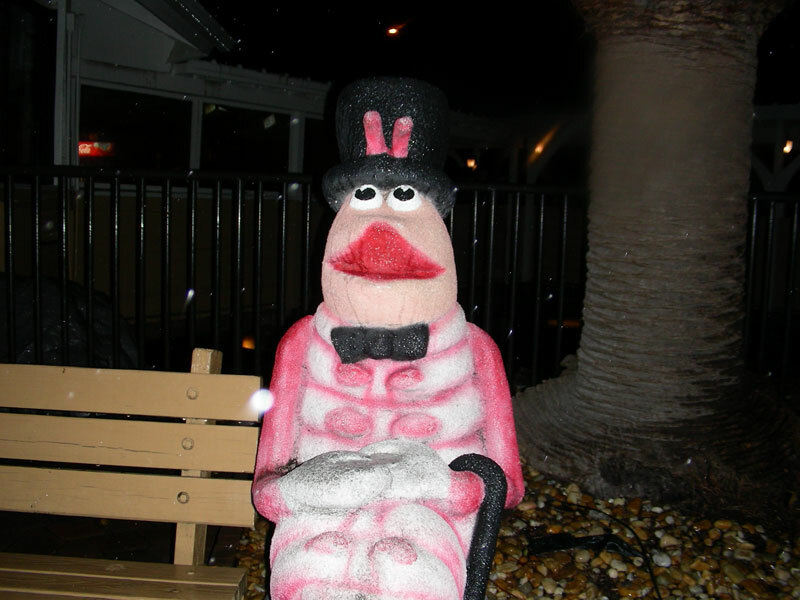 We drove to Titusville and were greeted by a giant concrete shrimp. 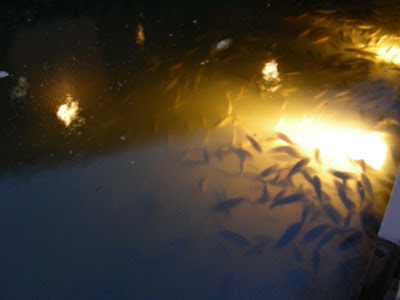 There was a wait, so I passed the time by watching the fish in the restaurant's stocked pond. We were seated, and were quickly served these delicious hush puppies covered in powdered sugar. And then it was time for the rock shrimp. The first plate of these butter soaked crustaceans consisted of about three dozen rock shrimp and a side of cheese grits. 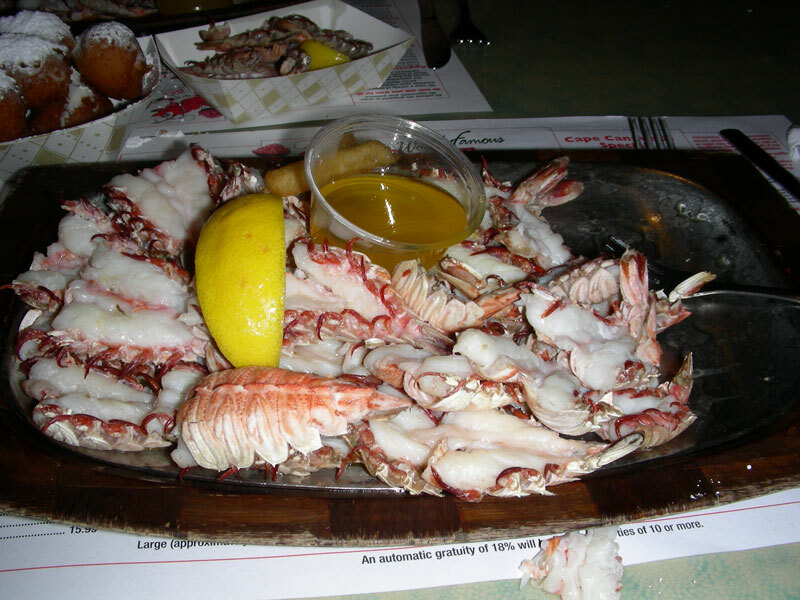 On a normal occasion, three dozen rock shrimp and the various sides would have been plenty to eat. 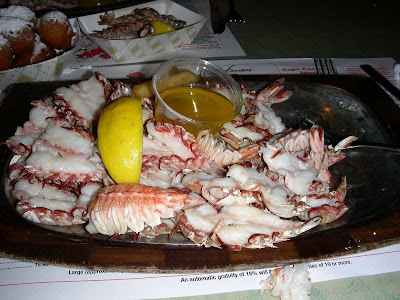 It should have been too much to eat, but since the waitress kept on bringing out more plates of shrimp, we ate more of these delicious cockroaches of the sea. If my calculations are correct, our table went through sixteen dozen shrimp by the end of the meal. The amount of food consumed is kind of disgusting and obscene thinking back to it now. I got food from a stand selling Cajun food called Herbert's Grill. I ordered a plate of Jambalaya, which perhaps wasn't the wisest choice from the back of a trailer. I hate to say it, but this was some of the worst Jambalaya I've ever had. The globules of pork fat that coagulated in with the meat really were unappetizing. 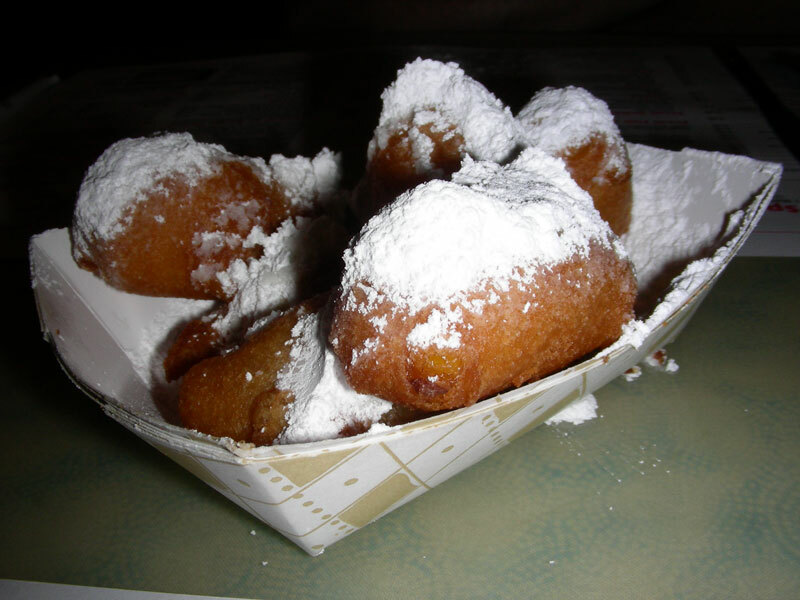 But then again, I suppose this should have been expected when ordering something at a fair that wasn't deep fried on a stick. I had never been to Avalon Park, so I decided to check the place out and get dinner. I considered giving Brianto's Original Hoagies a try, which seems to be a favorite among some of the other local food blogs, but I wasn't in the mood for a meaty sandwich. Instead, we settled on a place called Papa Gio's to get pizza. 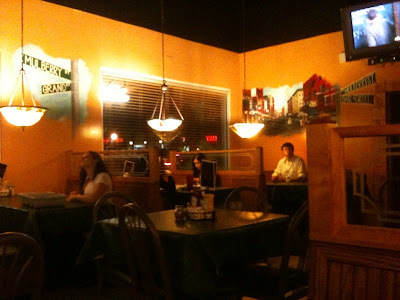 Inside, the dining room walls were painted with both scenes from New York's Little Italy neighborhood and scenes of Italian countrysides. 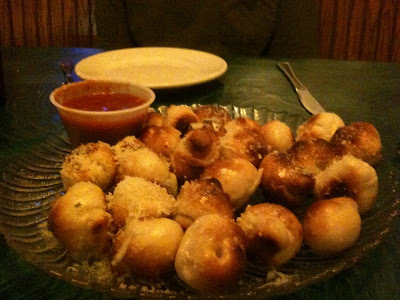 We started with some garlic knots. They were okay, but definitely not the best around. These knots actually had very little garlic on them, which kind of defeated the purpose. The half spinach/half meatball pizza soon followed the garlic knots. As far as New York style pizza goes in Orlando, this was one of the best pies I've had in a while. The crust was nice and thin. They got the proportions of cheese and sauce perfect, and it all tasted really good. I'm always reluctant to order spinach as a pizza topping because it's hard to know what you're going to get. The worst is when you get chopped frozen spinach on a pizza, which then combines with the cheese while cooking and ends up resembling creamed spinach. 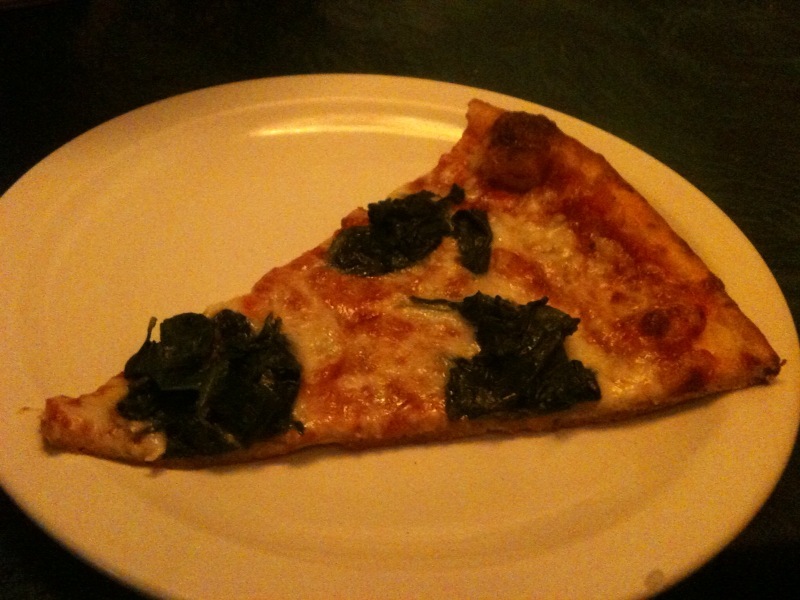 Other times, you will get fresh spinach leaves on a pizza, which I like. And yet other times, you get sauteed spinach which can be really good if done right. 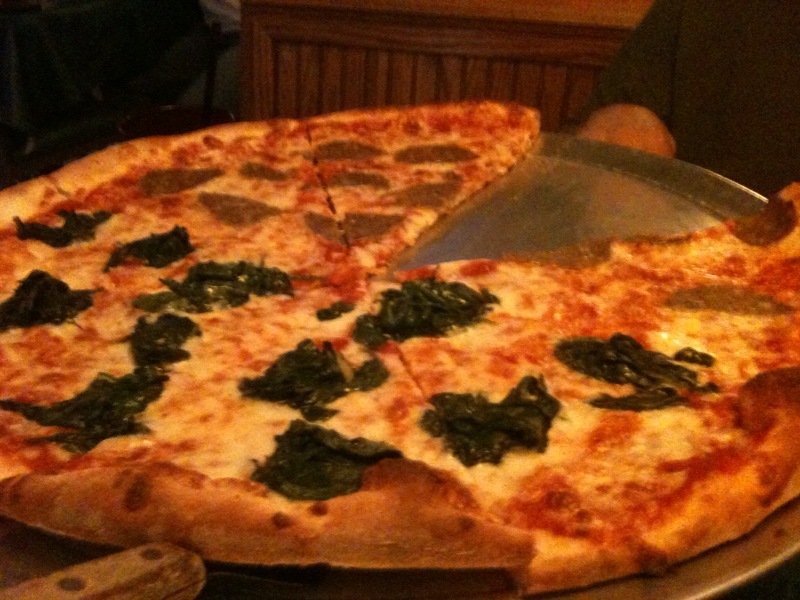 This is how Papa Gio's made their spinach pizza and they did a good job. It was nice and garlicy, but the only problem was the spinach didn't seem to be drained fully before being put on the pizza. While the meatball side of the pie was nice and crispy, the spinach side was way too soggy in spots where there was too much spinach juice. But really, it was a minor complaint to a really good pizza. I'd gladly expose myself to the radioactive trace elements from the power plant to get more pizza from Papa Gio's!